As you can see on this page, I have released an ebook about viva preparation! 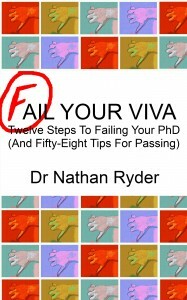 Fail Your Viva is my first ebook, and something that I have been working on for some time, along with a few other writing projects. Recently I was offered the chance to be a participant in an online course about self-publishing via the Kindle Store. I realised very quickly that there was not much stopping me from publishing. I’m very excited to have a book out there, and if you’ve read it and have comments do let me know. If you have the time to rate it and write a review on the Kindle Store that would be great! The cover of my ebook!